The thickness of the rough comes under scrutiny at the majors. The subject of how the host course is set up is a key talking point at every major championship. The width of the fairways, height of the rough and speed of the greens are analyzed to the nth degree then either praised for being 'fair' or condemned for being 'unfair'. Twenty, even ten, years ago, no one really talked about whether the course was fair or not. It was a very strange choice of words then, if indeed anyone used it, and it seems no more appropriate now. First, the picture of a millionaire golfer moaning at a press conference about how the course is unfair is ever so slightly nauseating and immediately brings to mind a stroppy four-year-old girl pounding her fists on a table and whining about getting too small a pony for her birthday. If you were invited to, or qualified for, a golf tournament at which you stood a chance of winning a million dollars, were guaranteed several more in resulting endorsements, and earned exemptions to more events at which you could win another boat load of cash, would you complain...about a single thing? Second, as a non-golfing friend rightly pointed out recently, in golf it really doesn't matter what the course looks like or how it plays because everyone in the field is playing the same course. It would be unfair if, for example, half the field at the Farmers Insurance Open got to play the North Course at Torrey Pines three times and the much tougher South Course only once while the other half had to play the South three times. But that doesn't happen. Everyone plays the North once and the South the rest of the week, assuming they make the cut. Tom Doak told me the only way a course could be unfair was if most of its holes doglegged from right to left and therefore favored a player that draws the ball, or from left to right and therefore played into the fader’s hands. This is true to a degree, but even then the player could always learn how to draw or fade the ball better. Another matter to which some commentators attach far too much significance is a course's difficulty, basing its quality on how hard it is. This is total nonsense. Oak Hill last week made a very big deal of the fact only ten players had ever broken par there in its five previous majors. That is not the true measure of the course’s undoubted greatness. Give me a couple hundred acres, a bulldozer, some seed, a lot of fertilizer, and some hoses, and I’ll build you a course on which nobody could get within ten shots of par if 50 majors were played there. Building or maintaining a difficult course must be one of the easiest tasks a designer/superintendent must ever have to do. Just create a few forced carries, cut the fairways 15 yards wide (or narrower), grow the rough nice and high and, better still, syrupy thick, and make the greens so hard a Phil Mickelson sand wedge would bound over the back of the green. That brings us to Oak Hill’s set up for the PGA Championship. Kerry Haigh, the PGA of America official responsible for preparing PGA Championship venues typically gets a lot of praise for his set-ups and deservedly so. Apart from the shaved bank at the front of the 5th green, the same aberration as the shaved bank in front of the 15th green at Augusta National during the Masters, Oak Hill was set up sensibly. As we have seen, the guy whose decisions determine how the course plays has a number of 'weapons' at his disposal to protect the course from what he regards as humiliating scoring – specifically, the course’s length, fairway width, thickness of rough, and speed of greens. US Open courses have traditionally used every one of these defenses to prevent low scores. 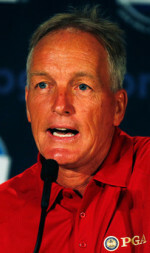 Former USGA President Sandy Tatum famously said US Open venues tried to identify the best players, not embarrass them. It was a pithy comment, but how true was it really? Did every one of Jack Nicklaus's 115 professional victories occur on US Open-style set-ups? Of course not. But the courses on which he won that didn’t mirror the US Open’s distinct style still identified the best player. How would Tatum explain the fact Nick Faldo, Seve Ballesteros, Greg Norman, Phil Mickelson, Jimmy Demaret and Sam Snead never won a US Open but Lucas Glover, Michael Campbell, Steve Jones, Orville Moody and Jack Fleck did? The same way the R&A explains winners like Ben Curtis, Todd Hamilton, Paul Lawrie and Bill Rogers, how Augusta National explains Gay Brewer, Charles Coody, Tommy Aaron, and Bob Goalby, and the PGA of America Jeff Sluman, Wayne Grady, Shaun Micheel, and Rich Beem. With intense major championship pressure weighing heavily on their shoulders, and with an opportunity to make history, they still happened to hit fewer shots than anyone else. They were, unlikely as it seemed before the tournament began, the best player in the field that week. It has been a popular move. Though they can't impart as much spin on the ball as they can from the fairway, and consequently don't have as much control over the shot, players aren't punished excessively for missing a fairway by a few inches, and can still attempt to reach the green. With graduated rough, they aren't forced to aim sideways and hack out with a lofted club. 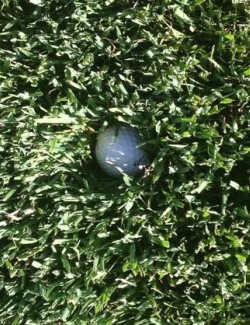 It didn’t happen at Merion this year, however, when the rough made balls vanish just a yard from the fairway. No doubt Davis considered the course too short to be giving players clemency for even slightly off-line tee shots, and the result was a winning score of one-over par and a telecast that few would have sat down to watch had it not been the US Open and the fact Phil Mickelson had a chance of winning one at last. Where I think Haigh gets it right is by not taking venues to their absolute limit or, as happened at some US Open venues in the past, beyond even that. The fairways may not be terribly wide at the PGA Championship, and the rough is plenty thick, but the greens aren't typically concrete-firm and don’t measure 15 on a stimpmeter. And they usually stay green. The US Open's great historical significance gives it license to make excessive demands of the players. Even though golf's governors are trying desperately to present golf as a fun activity, there is probably room for one tournament that tests players as sternly as the US Open. Mind you, calling for players to speed up play and trying to attract new players while viewers watched the best in the world taking five hours to shoot 77 on a desperately difficult Merion was perhaps a little awkward. Some folk say they enjoy watching the world's best struggle, but a few more US Open-like events would soon get tedious surely. If the PGA were to mimic the US Open too closely, it would potentially create another less than compulsive telecast, and probably discourage more people from taking up the game than it encouraged. But while Haigh is right not to check all the boxes, I would rather he removed the heavy rough and replaced it with firmer, quicker greens. Firm, quick greens are the best way to distinguish major championships from run-of-the-mill tour events because soft, spongy greens enable imperfectly-struck shots to stay on the putting surface. Before the PGA started, Lee Westwood remarked that heavy rough was the right way to punish wayward drives. Maybe, but there is nothing so good at sucking the drama out of a hole or indeed a situation as a player finding heavy rough and having no chance of reaching the green. The same is true of water hazards which is why some of the more thoughtful architects prefer not to build them. As Bobby Jones once said, the difference between a bunker and a water hazard is like the difference between a car crash and plane crash - at least you have a chance of recovery from a car crash. If a player finds heavy rough or water off the tee, he has more or less shot himself out of the hole long before he and his opponent/fellow competitor have reached the green. The level of excitement plummets. It doesn’t disappear entirely because the player that doesn’t hit into the water can still take four putts but, more often than not, once a player is in the water or thick rough the match/hole/day is over. Bunkers in the rough? Not ideal. In the crucible of major championships, mistakes like wayward drives shouldn't be exempt from consequences certainly, but would it not be better to keep the rough, the first ten feet of it at least, fairly short like Mike Davis's, or even eliminate it altogether? The player would face an awkward angle to the green and a shot he would definitely have a hard time getting close to the flagstick, but he would at least have a chance, giving viewers the opportunity of seeing a Mickelson miracle shot rather than a Mickelson chop on to the fairway. Something else I’d prefer not to see is fairway bunkers in the rough. Did you notice the two bunkers in the rough to the right of the 18th fairway at Oak Hill last week? Fairway bunkers should really be located at the sides of the fairway (or even in the middle) so badly-directed tee shots can roll, as well as fly, into them. The task of setting up major championship courses isn’t easy in this day and age when officials are burdened not only with presenting a stiff and demanding examination for the world’s best, but also trying to promote an exciting tournament that will hopefully generate good viewing figures and inspire people hitherto indifferent towards the game to give it a go. 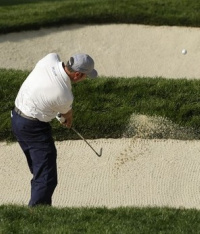 I don’t care much for the heavy rough or the fairway bunkers in it, but Kerry Haigh gets it about right.